This article provides some unusual popularized explanations of quantum physics. I believe it can provide a new perspective for this complicated theory. This is why I strongly suggest you read it, even though you have already been watching a lot of popularization of quantum mechanics. For long, physicists have been debating about the true nature of light. While Newton imagined it made of small particles, this rather intuitive concept was suddenly shattered by the double slit experiment realized by Thomas Young in the early 1800s. In this article we will almost only focus on this experiment and its numerous variants, as, according to Nobel prize winner Richard Feynmann, [it] has in it the heart of quantum mechanics. In reality, it contains the only mystery. So what’s the double slit experiment? This experiment is usually rather done with lasers, but Derek Müller’s box enables to take it to the street in a pretty cool way. Indeed. To explain this phenomenon, the wave theory of light was introduced, with James Clerk Maxwell’s theory of electromagnetism as the golden age of the theory. In this setting, light was seen as an electromagnetic wave. Now, if, at some point of the field, values are high, then there is a perturbation of the field at this point. This perturbation can then propagate, like waves on water. A wave is a propagating perturbation of a field. OK. So, in the 1800s, people thought that light was a propagating perturbation of the electromagnetic field? Yes! This enabled to explain a lot of other phenomenons. But then came the discovery of the photoelectric effect. In some specific setting, lighting a metal could induce an electrical current. What was troubling is that the electrical current was induced if and only if the wavelengths of light were small enough. If you used red light, there was no current. But if you used blue light, there was. This appeared like a discontinuous phenomenon which was incompatible with the continuity of Maxwell’s equations. So what would account for this discontinuity? In one of his 4 earthshaking papers of 1905, Albert Einstein explained the discontinuity by the fact that light could actually be thought of as a composition of elementary particles called quanta of light or photons! He justified this surprising assumption by the fact that the energy distribution of light was very similar to the energy distribution of particles of a gas. Another evidence supporting his idea was the discovery of spectral lines of emission and absorption. I already have a lot to say so I won’t dwell to much on this here. But if you can, please write more about these phenomenons. But I thought that Young proved that light wasn’t made of particles! I know! Yet, this didn’t prevent Einstein from receiving a Nobel prize for his idea of photons. I’m totally lost! Is light made of particles or not? This means that, just like photons, electrons appear to have both particle and wave properties! This is what scientists called the wave-particle duality, and is often interpreted as particles sometimes behaving like waves. In fact, quantum field theory even suggests that forces also are both waves and particles, as explained in Thibault’s article. I totally agree! So let’s better understand what’s going on! The solution provided by many scientists in the 1920s and 1930s was to think of matter and light as a collection of elementary entities. But these elementary entities, which we call photons, electrons or anything else, are not actually particles. Rather, each entity is a wave. However, physicists have now got used to calling these elementary entities particles, but you need to keep in mind that these are not to be thought of as point objects but rather as waves. Let me rephrase the scientists’ idea of that time because it’s very important: All things are made of elementary waves. This phrase corresponds to quantum mechanics, not more developed theories like quantum electrodynamics (QED) where waves can be combined to form new elementary waves, making each not really elementary… Let’s stick with quantum mechanics here! I know! 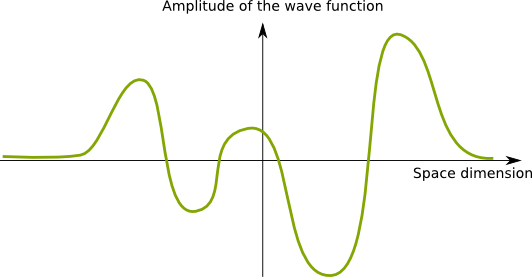 The following figure displays a 1-dimension wave function, that maps locations with the amplitude of the wave. Keep in mind that the following wave function represents one particle only. Note that this figure fails to represent the fact that the wave function actually has complex values. But this won’t be much of a problem for this article though. Does this assumption of elementary waves account for interference patterns? Yes, because elementary entities are waves! These waves can add up to be constructive or destructive, creating interference patterns. What about the fact that electrons could be isolated? Yes too, because beams of electrons are actually a collection of elementary waves known as electrons. This enabled to account for the photoelectric effect as well. The current is induced if electrons can capture an elementary wave which is energetic enough to make them leave the orbit of the atoms. The captured elementary wave is a photon with enough energy. Wow! The wave function does account for all the experiments you mentioned! I skipped the conclusion given by the video because I find it misleading, as it shows the electron as a particle dividing in 2 and recombining itself. It’s an interesting interpretation but it’s absolutely not what quantum physics says. OK, so what happens when electrons were shot one at a time? Each electron lands at one particular location on the screen. But the locations where they arrive are not all the same! This is very weird, since all electrons are similar. More precisely, they are described by identical wave functions. And yet, they all end up at different location! Once collapsed the wave then resumes its propagation. 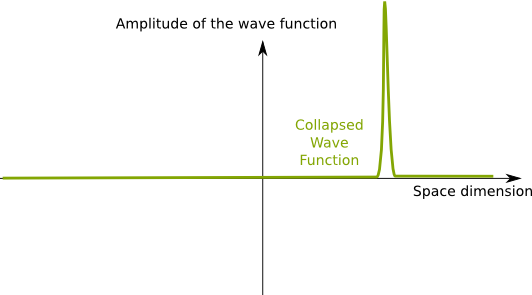 But more than the way waves look, what needs to be stressed is the fact that the collapse of the wave functions occurs in a inherently random way. This means that two identical experiments yield different results! Does this mean that anything can happen? Does this even have a sense? If anything can happen, why is the world still making sense, at least at our scale? These were questions that even Albert Einstein couldn’t handle, as he famously refuted quantum theory by stating that God doesn’t play dice with the world. Yet, experiments after experiments, over almost 100 years, this quantum effect has been proven again and again. So it’s really true? Anything can occur in the quantum world? Things are totally unpredictable? What I haven’t told you yet is that, behind this seemingly quantum unpredictability, there actually is amazing well-defined world of probabilities. Even though the results of experiments could not be predicted, the probabilities of the outcomes could be computed with incredible precisions. Let’s reconsider the double slit experiment with one electron at a time. As more and more electrons were sent, an interference pattern appeared, as if all were sent simultaneously. What physicists realized is that this interference pattern was revealing the probabilistic distribution of the outcomes of the single electron experiment. Yet, this interference pattern also corresponded to the wave functions! So the wave functions are related to probabilistic distributions? But if all that matters is the probabilistic distribution, why care about the waves? You need to consider the waves to understand constructive and destructive interferences. Also, waves contain information about energy and momentum of particles. But more importantly, as explained in this more advanced article, the dynamics of the wave is precisely described by Schrödinger equation. But finally and more importantly, according to quantum mechanics, the true nature of particles is being waves. What most popularizing videos call particles should rather be called localized waves. If you keep this in mind, I think you’ll understand quantum mechanics much better. To be complete, I’d have to say that the evolutive properties of a particle are not only defined by its wave, but also its spin. This is of great importance for advanced ideas like the Pauli exclusion principle which explains the fundamental octet rule in chemistry. When slits were observed, there was no longer any interference pattern! Everything suddenly occurred as if electrons had been moving in straight lines all along. This was absolutely shocking: The outcome was modified by the mere fact that we were observing electrons along the way! Waw! This is extremely troubling! But what was observed at slits? Detectors showed that electrons were moving through one of the slits, and one only! Recall that when we weren’t observing slits, the wave was spread and went through both slits. But wait… Does this mean that the wave function collapsed at slits, when measured? Yes, exactly! In fact, if we consider that particles are always waves that simply collapse randomly for any measurement, then we can understand what is happening. As we measure the particle at the slits, it collapses and becomes very localized. Because the size of the slit is larger than the spreading of the collapsed wave function, it’s good approximation to say that the particle only goes through one slit. Now, because the wave function collapsed, it’s no longer the same. Thus, it will not behave as if it hadn’t collapsed. This means that the result will no longer be the same as if we hadn’t observed particles at the slits. That’s why observation of slits affects the outcome of the experiment. And yet, even when the observation of slits was delayed, things occur as if the observation of slits wasn’t delayed: There was no interference pattern! I don’t get it! I thought that waves collapsed when measured, not before they were measured! I know. This is extremely troubling! This leads us to the most fundamental misunderstood question of quantum physics, known as the measurement problem. Shortly put, it consists in asking: What’s a measurement? Out of context, it would sound like a technical detail. Yet, as we have been discussing it, measurements are parts of the laws of physics, as they affect the outcomes of experiments. And yet, we don’t even know what they really are. What do you mean? Of course we know what a measurement is, don’t we? In 1935, Nobel prize winner Erwin Schrödinger introduced one of science’s most famous thought experiment to illustrate how much we don’t understand measurement (although I’ve heard that his goal was rather to ridiculize quantum physics). Oh yeah! Wasn’t it something with a cat? Yes! It consists in putting a cat in a box with a radioactive atom and poison. If the atom decays then the poison is released and the cat dies. The box is left for a minute. This gives the atom a fifty-fifty chance to decay. Now, if don’t equip the box with any measurement device, then it is in a quantum state. This implies that the cat is both dead and alive, as displayed in the following video from The Open University. Isn’t it equivalent to saying that the cat is dead or alive? No! Reconsider the double slit experiment. When we observe slits, the electron is indeed in the left or right slit. But if we don’t observe slits, it is both in the left and right slits, because the wave function spreads over the two slits. The two cases are very different, as we can see in the results of the experiments. Similarly, here, the cat isn’t dead or alive. It is both dead and alive. And until measurement, that is, opening the box and checking, it is in this superposition of states. Waw! That’s troubling! But wait… Doesn’t the cat count as an observer? Doesn’t its heartbeat count as a measure? Well, that’s a troubling question you’re asking here… This is precisely the measurement problem! And, shortly put, there is no accepted explanation for it. But there are ideas to explain it, aren’t they? We’ll get to this eventually. But first, let me show you the measurement problem at its worst: entanglement. What I’m about to present here is my own creation. It seems to perfectly represents entanglement to me, but I might be mistaken since I’m not an expert of quantum physics. If you are, please correct or confirm what I’m about to say. Let’s reconsider Schrödinger’s cat. Assume we could now separate the radioactive atom and the cat, after they have been put together for a minute. Let’s keep the radioactive atom with us on Earth, while we send the cat far far away, in some distant galaxy. Now, if we still haven’t made any measurement of the cat nor the atom, both are in a quantum superposition state. The cat is both dead and alive, while the atom both has and hasn’t decayed. But the fates of the cat and of the atom are linked. When we measure the state of the atom, quantum mechanics says that it will instantaneously affect the state of the cat. Are you saying that if we observe that the atom has decayed, then the cat instantly dies? Yes! And if the atom hasn’t decayed, then the cat instantly lives! It’s as if the information about our measurement instantaneously affected the state of the cat. Waw! That’s weird. But didn’t Einstein prove that nothing could occur instantaneously? He did! In his theory of relativity, Einstein proved that nothing travels faster than light! Worse than that, he proved that simultaneity didn’t even exist, as it depended on the observer. Therefore, entanglement seems to totally contradict his theory! This was unacceptable for Albert Einstein, who famously referred to this phenomenon as spooky action at a distance. OK… But can’t we imagine that the atom and the cat fall in definite states as soon as they are separated, in which case measuring the atom enables us to simply deduce the state of the cat, given the state of the atom? What you’re saying corresponds to saying that the cat is dead or alive rather than dead and alive. That’s what Einstein suggested. After decades of endless debates, Irish physicist John Bell proposed an experiment to settle the arguments. This experiment was then improved by Alain Aspect who separated the cat and the atom far enough so that there had to be a faster-than-light communication. This is explained in the Fabric of the Cosmos: Quantum Leap. So what was the result of the experiments? The experiments showed that Einstein was wrong. The cat and the atom were actually in a quantum superposition state, and there was an actual spooky action at a distance. So instantaneous communication is possible? Weirdly enough, it appears so. Applications are amazing! Perfectly secure cryptography can be achieved, as explained in Scott’s article on quantum cryptography. Even crazier, as shown later in the Fabric of the Cosmos: Quantum Leap, teleportation devices are currently being constructed based on entanglement. So far they’ve teleported photons, but at some point in the future, they might teleport people! 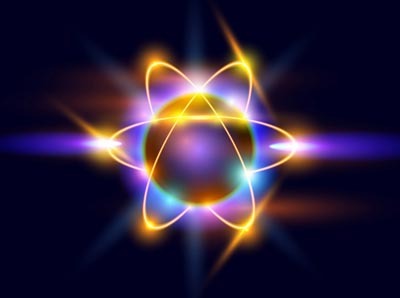 The idea is based on the possibility of influencing the quantum state of the atom to increase the chances of eventually measuring it not-decayed. This instantaneously affect the state of the cat and increases its chances of being alive, when we will have measured the state of the atom. OK, that’s it, I’m totally lost by entanglement! Yes! That’s the big question of quantum mechanics! Let me recall what we have found out about measurement in this article. Measurement implies a collapsing. But it’s not only about the collapsing of a wave function. Rather, it’s a collapsing of a collection of wave functions throughout time (as shown by the double slit experiment with delayed observation of slits) and space (as proved by entanglement). This means that, because of this property of measurement in quantum mechanics, our universe is inherently a non-local, and everything seems connected. But isn’t there any scientist who at least have an idea of an answer to the measurement problem? I want to add that I can’t really agree with any of these interpretations of quantum mechanics, because I simply don’t understand any of them. Once again, the measurement problem is still highly misunderstood and there is no predominant opinion in the scientific community as displayed in this video from Sixty Symbols. By assuming that all things are made of elementary waves, and by using equations of quantum mechanics to study the dynamics of these waves, physicists have been incredibly successful in explaining a very large range of weird experimental observations. This simply makes quantum mechanics the most tested and yet not refuted theory science has ever produced. And its applications to technologies are overwhelming! In particular, the invention of the transistor, which has then led to the explosion of new electronic and telecommunication technologies, has been the result of the understanding of quantum mechanics. Can you recapitulate the essence of quantum mechanics in one or two sentences? Sure. The essence is that everything is made of elementary waves. Their dynamics either corresponds to Schrödinger’s deterministic equation, or to a probabilistic collapsing. The latter one refers to the measurement problem. Although the probabilistic nature of its outcome is very well described, the cause of its occurrence is still highly misunderstood. This is partly because of its non-locality through space and time, and partly due to the lack of definition of the concept of measurement. If you want to go further in the understanding of quantum mechanics, read my article on the dynamics of wave functions! :But if we understood measurement, we’d understand the Universe, right? Hum… No. Quantum mechanics seems incapable to include gravity. Although Paul Dirac managed to include Einstein’s theory of special relativity, making things work with Einstein’s general relativity is still mainly considered to be an open problem. Physicists are still in a quest to a unified theory of everything. The best candidate so far is string theory, but it’s still questioned by plenty of scientists. Quantum Mechanics Made Easy by Sean Carroll. Now if I’m to wrap my around this….. when we figure out one or two aspects.. he changes it to another… ? Swapping out one for the other… ?just a random selection of reality we are in? So we not suppose to figure it out… it’s a system that won’t allow us to get further? No matter what. One cancels the other out, but all work individually but when there placed together…???? A broken clock is right twice a day…. and that means it wrong most of the time… so give the slight fraction determine a final result? Too much questions to ask… I’ll leave simple for now and the rest… and when I say we, I mean the human race.